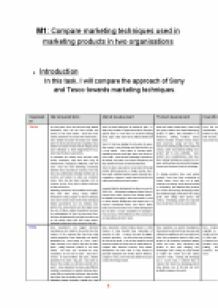 ﻿M1: Compare marketing techniques used in marketing products in two organisations 1. 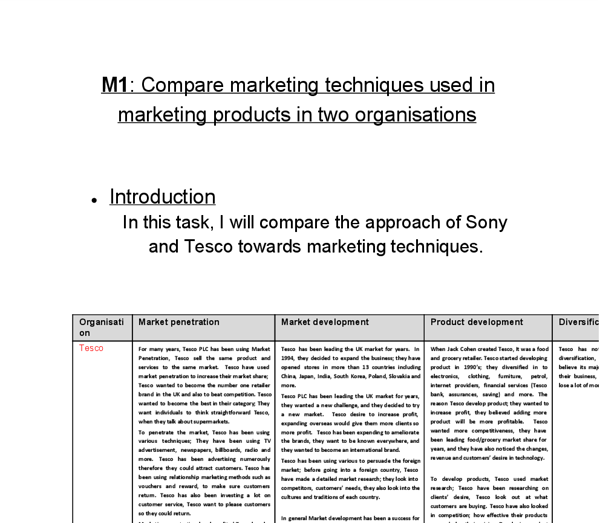 Introduction In this task, I will compare the approach of Sony and Tesco towards marketing techniques. Organisation Market penetration Market development Product development Diversification Tesco For many years, Tesco PLC has been using Market Penetration, Tesco sell the same product and services to the same market. Tesco have used market penetration to increase their market share; Tesco wanted to become the number one retailer brand in the UK and also to beat competition. Tesco wanted to become the best in their category; They want individuals to think straightforward Tesco, when they talk about supermarkets. To penetrate the market, Tesco has been using various techniques; They have been using TV advertisement, newspapers, billboards, radio and more. Tesco has been advertising numerously therefore they could attract customers. Tesco has been using relationship marketing methods such as vouchers and reward, to make sure customers return. Tesco has also been investing a lot on customer service, Tesco want to please customers so they could return. Marketing penetration has benefited Tesco hugely, they have been saving money; Market Penetration?s cheap compare to others techniques, Tesco don?t need to invest a lot in these techniques, Market penetration?s low risk methods, they produce the same products and also target same, less risk of failure. ...read more. very successful for Sony corporation, for the last 10 years , Sony had a revenue at least 60 Billion each years , Market penetration has been a big part. Sony wants to become the number one electronic provider in the world. Sony corporation has been using different methods to penetrate the market, they have been using different marketing techniques; Sponsorship, they have been promoting their in sports events (Champion League, Formula 1, World cup...) and Sony also sponsor different football teams around the world and F1 teams. Sony corporation started trading abroad in 1960; Creators of Sony founded Sony Corporation of American in 1960. In Japan, Sony was the biggest electronic providers, one of the aims was to become the best in the world, to do so they needed to control American market and Sony went to United States to compete with American company. Sony market development has been hard as they needed to persuade employees and market, they?re effective, compare to Tesco, and it has been harder for Sony to convince the foreign market. Sony corporation use product development, Sony started as electronic shop, Sony was only selling home appliances and home electronic. ...read more. and consoles (PS3) with different names. Sony started to use product branding recently. The reasons that change are; SONY wants to extend the company, they want to make it wider with range of product, they want to be less visible. Sony corporation had huge success the corporate brand Sony for years; they wanted to build a new brand to change. Sony still use Product corporation but not as much as before. Sometimes Sony corporation use corporate branding to facilitate sales of the product and they also use it lower the promotion expenses. Both Tesco and Sony think branding is important. Sony corporation use relationship marketing; similarly to Tesco, Sony also use reward methods called Sony Reward (when you buy one of Sony product, they offer cinema, shows, sports, events tickets) Sony also focus on customers satisfaction; they make sure that customers are satisfy with their products and services, so they will come back. Sony corporation had already build relationship with customers, after years, Sony has built trust with their customers, they always offer quality products. Relationship marketing benefit business hugely, it build loyalty and help companies to improve the markets. A Sony main survival strategy is innovation; over the years, Sony invented different products, Sony relies on their innovative product to survive. A survival strategy is important for Sony it will help to survive in the business world. ...read more. Our issue will be seeing whether if there is a market in the Bedfordshire for a new car firm and whether there is enough demand to support our business. We have decided that our target audience is going to be males aged between 19-45 and females aged between19-30. The total revenue of the company is £38,558m. The total revenue of Europe is £8695m; in US the revenue is £349m and finally the revenue in Asia is £8432m.The turnover of the company from 27th February 2010 is £62,500m. Tesco PLC is based globally, they are a national company. One has been emphasis on the growth of Core UK business in order to expand internationally. This growth has allowed that company to position itself in food and non-food sectors based on retailing services. Over the years, the company has witnessed financial fortunes which have been reflected in its growing sales. Both businesses also target kids and teenagers. They target kids because Tesco?s and Asda sell toys. This attracts them a lot however you won?t see a little child going to the counter to buy it. Usually the toys will interest the child who will pester their parents to buy it for them. The club card records all products a customer buys; this enables Tesco to offer them related goods. It also means Tesco have customers contact details on their database so can contact them direct with details of new products and services.